Samsung technologies, well known for innovative and most advanced electronic components and mobiles has foray in Tablet market with the launch of Samsung Galaxy Tab 4G. The device is enabled with Virzon's 4G LTE and supports Verizon Wireless network. The tablet running on Android 2.2 Froyo operating system and has a 7" capacitive LCD display with 1024x600 pixels resolution. It supports microSDHC card. A 5MP camera with LED flash also fitted in the table that allows to photo shouting and video recording. The device is capable to browsing Adobe Flash and HTML5. 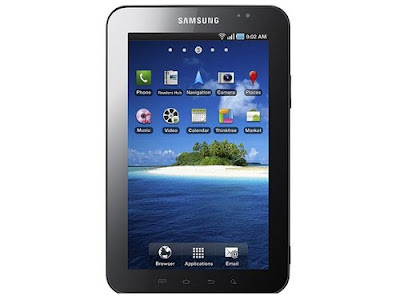 The company has not announced Samsung Galaxy Tab price and first it will available in the UK market, after that India. All the multimedia features and more you can read in the Samsung Galaxy Tab Review. The Galaxy Tab is still lagging behind the iPad in some areas, but it's not far behind. When the Android Honeycomb arrive next year, all Android tablets including the Galaxy Tab will be further improved and will definitely play an important role in the tablet PC market.